The Joy of Fashion: Goodbye Peeptoes! So today I decided to go a little crazy and try to wear wedges after two entire weeks of only wearing flats... and the verdict? My fractured toe hurt after just an hour or so, so I can't wear these shoes yet! boo hoo! Marie, this skirt is SOOOOO cute.... Perfect outfit. 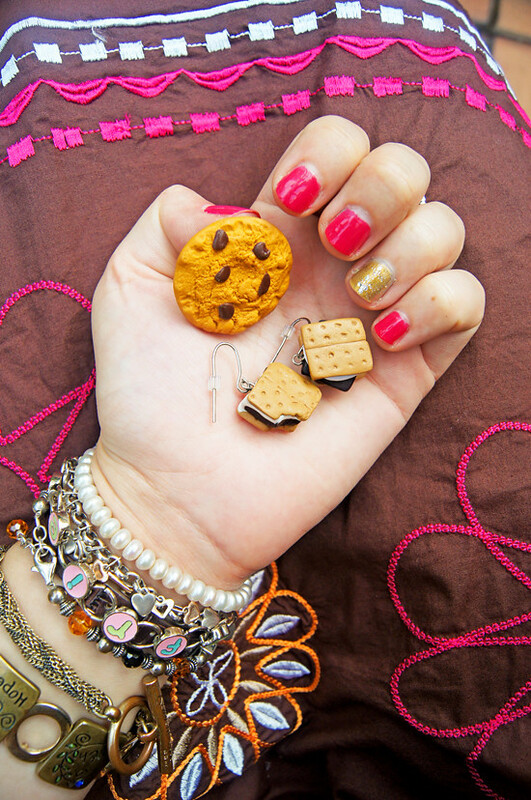 I love that your accessories are sweets.They're adorable! The accessories are too cute! Love them! Oh my goodness your earrings are so cute! Oh my goodness, your earrings are super cute! Love the look! Oh your poor toe! Hope it heels up soon. I must admit I'm loving your sweet accessories they add a touch of whimsy without looking kitschy. I love that skirt. Hope your foot gets better. Aww your toe will heal soon! When I injured my knee I couldn't wear heels for the longest time and I broke into them by wearing platforms and closed toe. It helped a little bit. :) Cute outfit too! Aww Marie, sorry you're still not back to normal, but I'm so glad you tried! 'Atta girl :) those s'more earrings are SO fun. I also love the fall colors in this outfit, it's perfect! you are absolutely adorable, girl! loving your style, and those accessories are just too perfect! aww too bad you couldn't wear the peep toe wedges but let's hope for the regular wedges! haha it must be hard not to wear heels! love what you are wearing. so cute and bright! and i love those cute little accessories! Adorable accessories! Definitely try some non-peep-toe wedges. I find peep-toes to be uncomfortable even though my toes are not injured. Something about the way your entire foot wants to fall into the peep-toe part. Good luck! Love the pattern mixing - so cute! 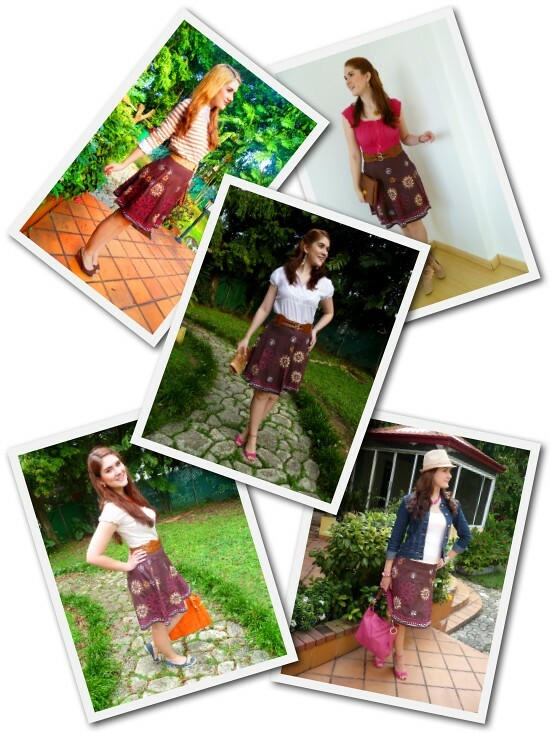 A skirt can be wored in different ways to give different look..just we need to have that fashion sense..you are creative! Nice looks! Loved it! love your outfit! Your jewelry is too cute!